A parishioner came in to the office a while back and asked to have a Mass offered for Donald Trump. I didn’t ask if she was an admirer or a critic, since we’re always ready to pray for those in authority, as St. Paul tells Christians to do. One way or another, President Trump needs prayers; he's had a hard week. The courts have ruled against him twice now. But it’s been a great week for America. Not so much because the travel ban was temporarily suspended but because the rule of law was magnificently respected. When one lone judge ruled against him, the president tweeted something disrespectful. But he didn't ignore the ruling or lock up the judge. And when three judges refused to overrule the first, the President said he’d go back to the drawing board and come up with an executive order less open to legal challenge. What power the law has in a democratic society—more power, when push comes to shove, than any president or prime minister. Today’s readings remind us that law is also a powerful tool for God’s people. Understood properly, it is a gift by which God shows us the path to life. The first reading, from the book of Sirach, is a wonderful tribute to law; a wonderful tribute to the beauty of God’s Law. It begins with three words about human freedom—“If you choose.” There’s no policeman enforcing this law. But Sirach spells out the law as clearly as the U.S. Constitution. There are two paths, two choices, two ways of living God’s Law, the path of good or the path of evil, fire or water, life or death. Choose one way or the other. Sirach spells out the law as precisely as your GPS gives directions—not to restrict or punish or control but rather to help us. Has it ever struck you how fortunate we are to be guided so accurately through the crossings and turnings of life? I think most of us are inclined to think that law restricts or even obstructs our freedom. Yet if we think about it, that makes as much sense as complaining that the GPS tells you the way to Whistler is the Sea-to-Sky highway. Of course you can go to Whistler by way of Kamloops. Mind you, it will be a very long drive. Or you can head there on Highway 1, in which case you will never get there. The fact is, the moral law—both the law revealed in nature and the law revealed in God’s word—is a precious gift that enables humans to flourish and grow. It’s a gift we need most when we’ve lost our way and need to be guided back to the path of life. Like any of God’s gifts, the law can be misused or abused. At various times in the history of Israel and of the Church, some people thought that they could obey their way to heaven, without help from God. St. Paul rejects this way of thinking. To the Galatians he writes “we know that a person is justified not by the works of the law but through faith in Christ” (Gal. 2:16). He says the same thing in the Letter to the Romans: “we hold that a person is justified by faith apart from works prescribed by the law” (Rom. 3:28). Frankly, people today are rarely tempted to rely on law to save them. We’ve headed in the opposite direction. I haven’t met a legalist in years—but I know plenty of individualists, people who justify their actions by how they feel and how they think. 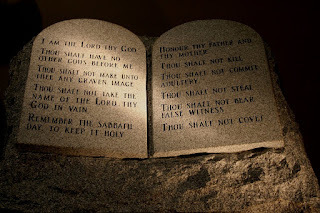 Although the many legal regulations that governed everyday life for the Chosen People are no longer valid, the commandments remain. There are still concrete rules of conduct given by God—but the new law is the Law of Christ, transformed by grace. Jesus teaches us this today by contrasting the external observance of the law in religious rituals and the dispositions of the heart that are an essential element of real righteousness. So how do we make proper use of this great gift from God? How can law help us choose life over death and good over evil? St. Paul adds that this wisdom is not the wisdom of this age. It’s not the wisdom of the majority or of the elite or of the media. It’s God’s wisdom, coming directly from him down through the ages. How do we discover this wisdom, which St. Paul calls “secret and hidden”? If we read to the end of the second reading, he tells us: God has revealed his wisdom to us through the Spirit. It’s only secret and hidden in the sense that it’s within our hearts. The Psalmist asks God for understanding of the law—for how can we keep what we don’t know? “Teach me, O Lord” we pray in today’s psalm, as we promise to keep his commands until the end. In other words, one way to learn what God commands is to ask him. In the quiet of our hearts, we ask God what we should do—or not do. Prayer like that is sometimes called discernment. On Thursday I was talking on the phone with a friend from Alberta, a real man of God—you have to be, with six kids! He told me what a huge difference it makes to what he chooses to say and do if he just stops in his tracks and speaks to God in his heart for two minutes. A second way to choose the path of life is to look at roadmaps from time to time—even to plan our trips in advance. God’s commandments are not only revealed in our hearts, they’re also found in the Bible and in the teachings of the Church. To use an example from this morning’s Gospel, before asking God to reveal to your heart his laws about divorce, it only makes sense to learn those laws from the Scriptures and from the constant teaching of the Church. Before a difficult conversation in the family or even at work, why not look for an answer to the problem in the Word of God or Catholic tradition? I like to ask people “what are the most important pages of the Catechism of the Catholic Church?” No-one gets the right answer: the index. The list of topics covered in the catechism is very detailed, and you very easily find concise and clear teaching about almost any moral decision that you face. That’s an incredible promise. But it makes sense. How can we follow laws and commandments if we have no trust in the Lawgiver? One of the ways we strengthen our relationship with God is simply by trusting him enough to obey, even when our human wisdom is still struggling to understand and accept. When we keep the commandments at some personal cost, we not only obtain the blessings they promise and the good things they protect; we also draw closer to God in trust, strengthening the virtue of hope. God has given us clear teaching, the examples of the saints, the sacraments, and—most of all—“the help of the Holy Spirit living in us” (2 Tim. 1:14).